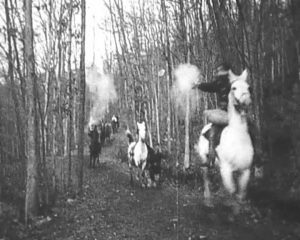 Still shot from the Great Train Robbery, 1903. In the late Nineteenth or early Twentieth centuries, adventurous Mesa County citizens might mosey on out for a vaudeville act, a lecture, a play, a sermon, country dancing, live music, a circus, horse racing, a baseball game, a boxing match, a carnival, the Mesa County Fair, a medicine show, or even a Chautauqua performance. Destinations for our humble Western masses might include the Park Opera House in downtown Grand Junction, the Mesa County Fairgrounds (now Lincoln Park), or simply a tent set up in a field where houses had yet to sprout. In later years, the Avalon Theater on Grand Junction’s Main Street, the Mile-Away Dance Hall (which hosted Benny Goodman early in his career), the rowdy Copeco Dance Hall between Grand Junction and Fruita, and Schoening’s Platform in Fruitvale were all viable landing places for fruit growers, merchants, workers, kids and dusty cowpokes lucky enough to have two coins to rub together. Starting in the 1900’s, Grand Junction’s high desert denizens were also able to attend motion picture shows. In his oral history interview, Levi Morse describes attending what he calls the first motion picture ever shown in town: The Great Train Robbery (filmed in 1903). In 1905 or just after, promoters showed the Edwin S. Porter film in a tent set up in a field between White and Grand Avenues, just east of 7th Street near what was then the location of the Grand Junction Public Library (and somewhere on what are now the grounds of the old R5 High School building). The film was all of 12 minutes long, but Morse says that it was “an incredible performance,” and that “people marveled at the scientific development which a motion picture showed.” For sound effects, someone stood outside the tent and fired blanks during the battle scenes. The Great Train Robbery is no longer under copyright and you can now watch this once modern marvel on the Internet (probably without someone standing next to you firing blanks). To find out more about early day Mesa County, listen to Levi Morse talk. Or check out the other oral histories in our Mesa County Oral History Project and our 970West Digital Collection. Posted in 970West, General, Local History.